With its focus on the design of the comfortable workplace, it would seem logical for the ergonomic equipment maker Humanscale to turn its attention to the quality of indoor air. Indoor air is, according to the Environmental Protection Agency, one of the top five environmental health risks in the United States. But designing the air is no easy task. To clean the air of even one room is an energy-inefficient undertaking, constantly compromised by the fact that no room is sealed, and people bring in dirty air every time they open a door. After four years in design development, and much longer in gestation, a desktop air purifier was launched by Humanscale at the end of last year. The Humanair makes an intriguing case study. 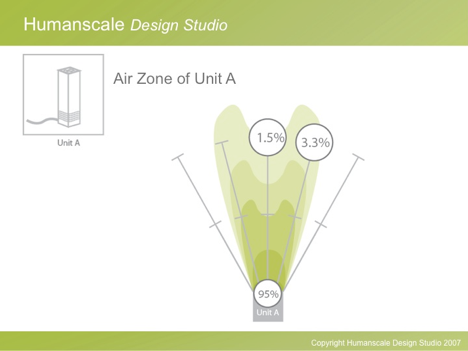 The product went through several iterations in pursuit of Humanscale's hunch that a localized solution was considerably more efficient than cleaning the air of an entire room. Since people actually spend most of their indoor time in one spot (in bed, on the couch, or at a desk), clean air could be delivered to local "zones" around the user. 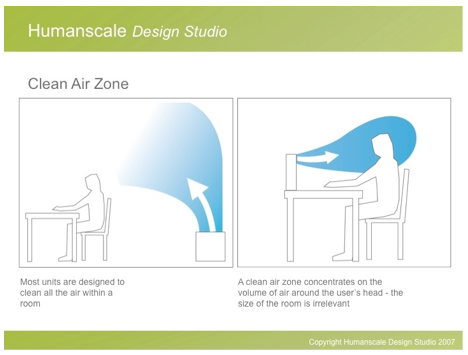 Humanscale's "clean air zone" concept. The technology itself brought its own challenges. Current systems use either the HEPA (high efficiency particulate air) or ESP (electrostatic precipitation) method of cleaning air. HEPA systems force air through tightly woven filters that trap particles, a method that is noisy--due to the drop in pressure caused by blowing air through a dense surface--and can be expensive, particularly if installed in centralized air conditioning and heating units. ESP systems first charge air in a "corona" field (high voltage, low current) before trapping the charged particles in some sort of conductive filter. This method proved highly popular due to its silent operation, but became plagued by controversy over claims by The Sharper Image about the performance of its ESP purifier Ionic Breeze. In fact, the entire air purifier industry was thrown into turmoil during the development of the Humanair after a court battle between Sharper Image and Consumer Reports culminated in bankruptcy proceedings for the retailer. Humanscale's product, which is based on the ESP technology, was taken back to the drawing board several times to ensure that it would bring something new to the genre, redefining the ESP category. 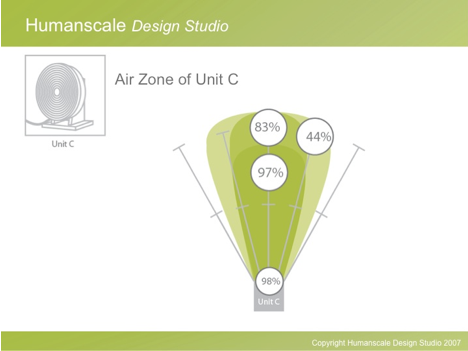 In essence, Humanscale set three goals: The new product had to be virtually silent (since it would sit next to the user); it had to be virtually breeze-free so as not to cause dry eyes (or distractions); and it had to produce no ozone. This last point proved to be particularly critical. 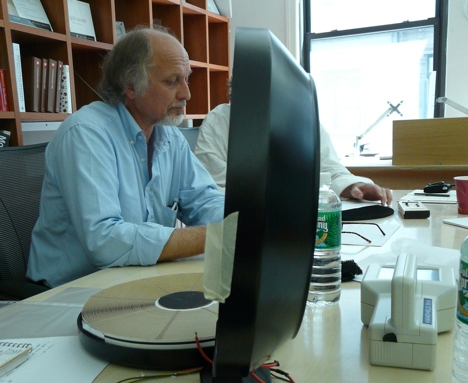 Inventor Andrzej Loreth in his studio. Origins Andrzej Loreth, a Polish-born inventor based in Sweden, first began experimenting with air purifiers in 1994, when he discovered that it was possible to create an effective filter out of folded paper rather than the charged metal plates conventionally used in ESP-based purifiers. He also noted that the ozone gas produced as a by-product of charging the ions in the air was reduced to barely measurable amounts by using the paper filter, a lower current and larger ionization chamber. Ozone is useful in the earth's upper atmosphere for protecting us from ultraviolet light, but at ground level is an irritant known to damage human and animal respiratory systems. The EPA sets a safe ozone limit at 50 parts per billion. Early Prototypes One driving concern surfaced in the early stages of the project. 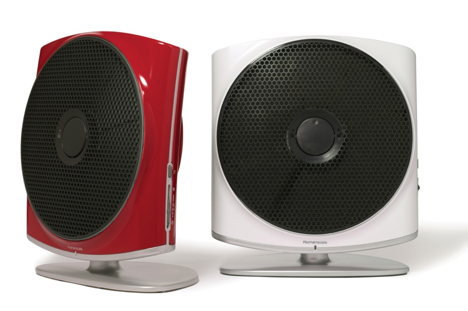 Visiting Loreth's studio in Sweden in early 2007, Humanscale designer Stefan Spoerl observed that Loreth's air purifiers were hand-built and fine-tuned to achieve high performance; the size of the units was not a concern. For Humanscale however, conscious of the limited real-estate of the desktop, size was tantamount. 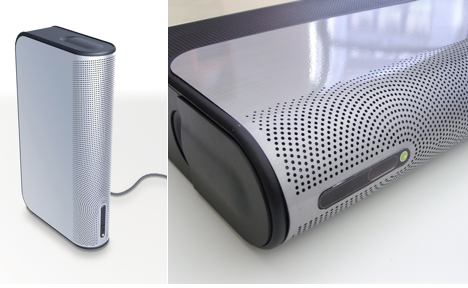 The design team began sculpting initial foamcore prototypes that suggested an 18-inch long lozenge shape would offer a discreet form for the desktop and house the three main components of the unit: two fans at the base, a charging chamber around a central high voltage corona wire, and at the top, the paper filter. 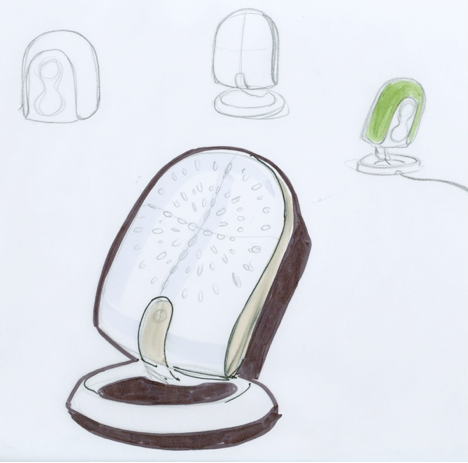 Around the Spring of 2007, Humanscale presented the air purifier concept to curators from the Museum of Modern Art as a candidate for MoMA's then-upcoming future technologies exhibition, "Design and the Elastic Mind." Although the exhibition sought ideas and technologies rather than finished forms, Humanscale built a prototype suitable for a MoMA display, developing the lozenge shape with a fine exterior mesh intended to support circulation of air while expressing the unit's function. 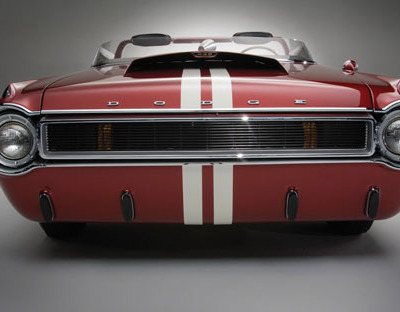 The prototype gained some early publicity for the project when the show opened the following year, even though subsequent iterations found the mesh patterns to be too restrictive and the lozenge shape inadequate for the performance criteria. Change of Direction By the Fall of that year, however, Spoerl and engineer Brad Augustine were having misgivings about the whole "small is better" premise. Whereas Loreth's larger units seemed to have no trouble cleaning large zones of air with the production of trace elements of ozone, as soon as the same technology was packed in a compact desktop unit, the performance went down and the ozone count went up. Spoerl and Augustine arrived at an internal meeting in October armed with their first real data from in-house tests with three different units. The clear performer in tests was not the tower or an evolved version of the MoMA prototype, but a round unit with a circular filter and two fans that Loreth had provided at an earlier date, but which had been rejected because of its relatively large size and conspicuous form. 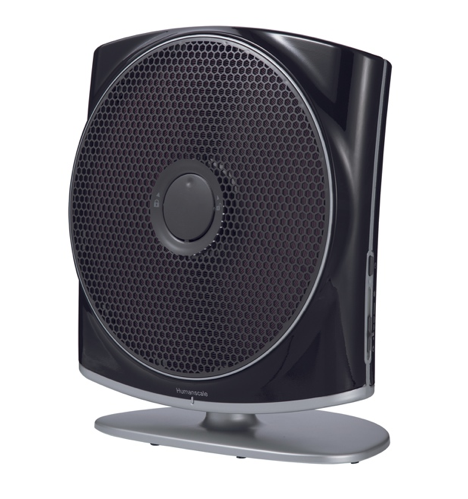 All three models performed with 99 per cent efficiency, but only the larger round unit could effectively clean a two-foot zone around the fan. This seemed to be entirely due to a larger filter surface. Where the smaller unit and the behind-monitor tower configuration were cleaning between 1.5 and 24 per cent of the air at a distance of two feet, the round unit was cleaning more than three times that, at 83 per cent. 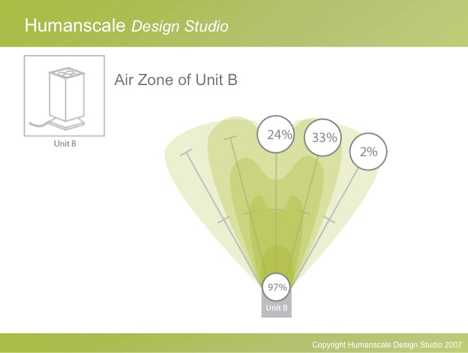 The Humanscale team made a decision to pursue the round form, but also to continue development of two additional units, a smaller and a room-sized version. The project was gaining momentum, as the designers sensed they had honed a mass-producible form, and began sourcing the plastic parts. The nuances of air cleaning were sharply in focus now, since the team was already testing prototypes in off-site laboratories. Team member experience at bringing air purifiers to market stressed the importance of testing early for certification, and clarified which tests were widely recognized. Specifically, the Clean Air Delivery Rate, or CADR, introduced by the Association of Home Appliance Manufacturers in the early 1980s is used by all air cleaner manufacturers and recognized by Government agencies. It tests both the volume of air cleaned, how well it removes pollutants, as well as whether any ozone is produced in the cleaning. CADR has its drawbacks: it does not measure unit size, power or noise in tests. 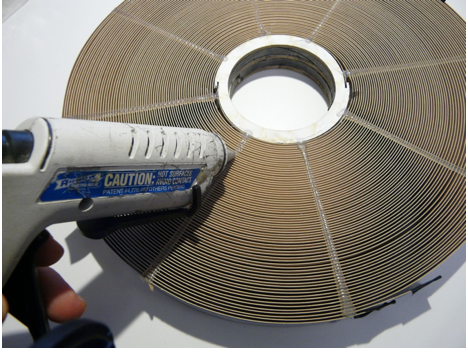 Many manufacturers, particularly those using the HEPA method of air cleaning by forcing air through a tightly woven fiberglass filter, achieve high CADR at the cost of high noise. Tests at this point included laying out the internal components of the purifier on a "breadboard" with transformers allowing minute adjustments in current and voltage. The goal was to achieve maximum cleaning efficiency with minimum current, but the extreme sensitivity of the system was proving perplexing, particularly when the components were moved into a housing. 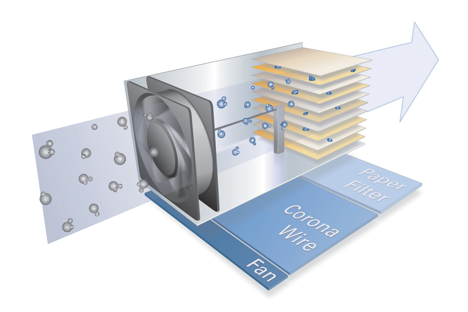 "The corona wire was quite variable," recalls marketing executive, Shane Cohen, "and there were also variations in wire thickness, humidity and power source to contend with. We were pulling our hair out." The project had reached a crossroads, one road moving toward production and the other going back to the drawing board. In favor of going forward was a strong sense of urgency and momentum, with Augustine and Spoerl booking ten CADR tests a day of its prototypes in a laboratory in Courtland, NY. But inconsistencies were still emerging between prototypes, and, back in Sweden, Loreth was making a new case for a unit with more fans. New Direction At certain eureka moments in design projects, Buckminster Fuller's notion of ephemeralization, or "doing more with less", seems a valid description of why one particular change works so well. At a point in mid-2008, Loreth delivered a radical change to the internal component array: instead of using a corona wire to create a charged air chamber inside the unit, he had returned to an earlier method of using a brush to create the corona field outside the unit. Air would be drawn toward the back of the unit, charged in the corona field, and the charged particles would attach themselves to the paper filter at the front. In this way, the unit could be made smaller while allowing the designers to increase the number of fans, thereby improving the CADR without adding noise or air turbulence. The downside of Loreth's latest solution was that all of the regulatory work on the previous protoype would have to be scrapped, and the unit redesigned. On the upside, it turned out that using a brush had the effect of stabilizing the performance of the prototypes, so that the ozone count was consistently close to undetectable. Loreth's adjustment meant that the Humanair could improve its performance within a smaller unit, and potentially with less variables in the testing. 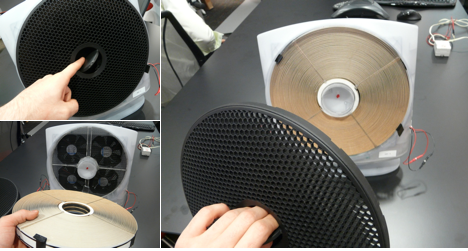 Spoerl and Augustine began developing new working prototypes, increasing the number of fans to three and finally four, in a grid arrangement behind the filter. 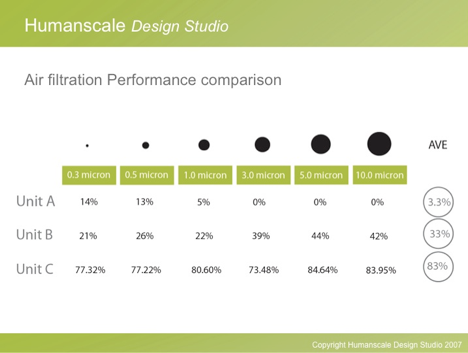 Humanscale had committed to debuting the product at NeoCon of that year, and further CADR testing was scheduled to be soon underway. In the tests, the lessons of the previous round proved invaluable. 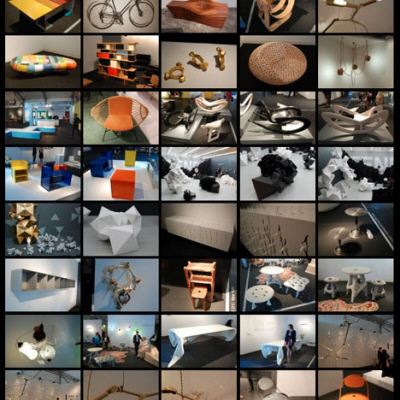 The concept prototype unveiled at NeoCon 2009 was by no means fully resolved but subtly hinted at the innovations inside: In plan view, the flat base of the unit suggested the exact perimeter of the corona field, which takes the shape of a jelly mold; in profile, the unit had the form of a letter "L." The base, initially articulated, allowed the user to adjust the angle of the device but this function was eventually dropped as unnecessary, which helped to save manufacturing costs. Final Design After NeoCon 2009, the product took one last formal shift under the new design director Mark McKenna, to emphasize the circular geometry of the functions inside (the corona field and circular filter) and in accentuating its role as a housing for the filter, gain a streamlined, more sculpted edge. This, too, was in response to the question of how to make it easy for users to change the paper filter and VOC filter, which is required periodically. In the final design, the front of the unit features a large circular grille that is opened by pressing a disk in the center. 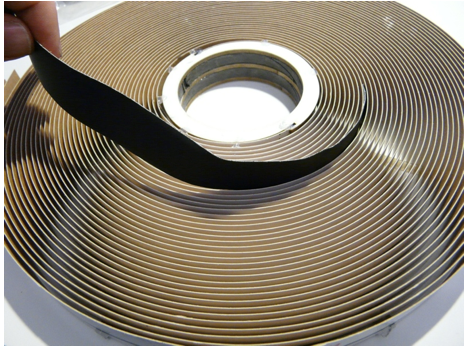 The disk mechanism solved several problems at once: Since the paper filter cannot be folded to the tightest point of its center, it has a ring shape, with a hole in the middle. This provided both a mounting and contact point and a place for the opening mechanism. Pressing the disk immediately activates a kill switch. Considerable attention was paid by the design team to this one key interactive moment. 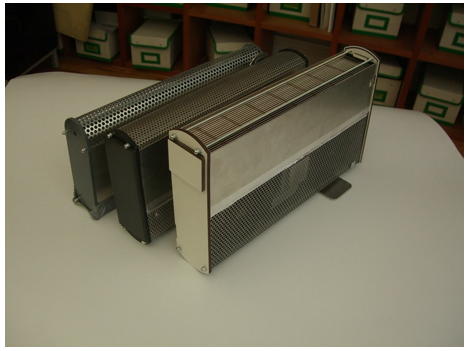 Since it was important that the filter be easy to replace, it seemed unnecessary to have a strict orientation, that is, the circular outer grill had to be replacable in any orientation. For this reason, the Humanscale logo was eventually placed under the removable panel, rather than on the disk itself. 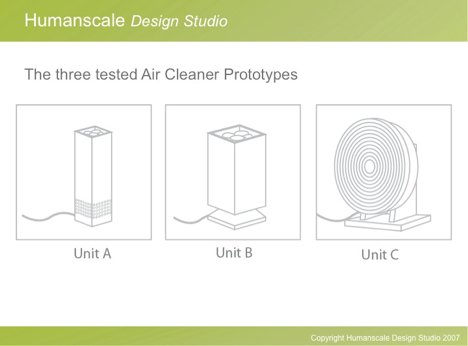 More Testing A corporate decision to make all of Humanscale's low voltage products 24 volts DC, (an emerging industry standard) had the unexpected benefit of making the certification process for the new design easier. Several regulatory hurdles were circumvented by dropping to DC from AC, including the need to have flame resistant materials throughout. Less easy was troubleshooting the final design, since the Humanair's low current is transformed into high voltage of up to 5,000 volts inside the unit to create the corona field and attract particles. Comparable to static electricity, the high voltage created several unexpected challenges as the designers began to put together working prototypes. "We were used to dealing with standard electricity," says McKenna. "With this unit we're turning air into a conductor--we were inadvertantly creating small voltage fields all over the inside of the unit." 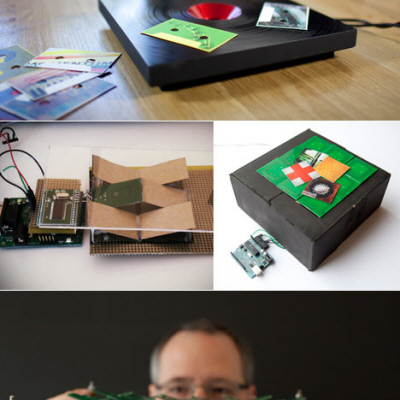 Tests of the prototypes were initially perplexing. "The units, when they were apart on the breadboard would work well but when we stuck them inside the housing they didn't work," says McKenna. "We spent a few intense weeks going through every single connection and checking it, learning about shielding, shortening power losses, the differences between glues." For example, the designers realized that the axles in the small computer-style fans in the prototype were distorting the corona shape because they were metal. 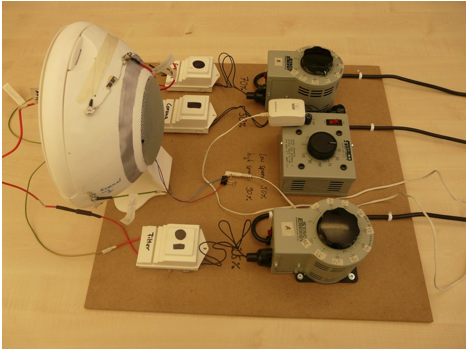 Placing small pieces of tape over the fans increased the unit's performance dramatically. At another point, the designers realized that a white glue used in the paper filter, even when dry, contained enough moisture to conduct electricity. "We replaced it with hot glue and went from five percent to a hundred percent performance," says McKenna. More troubleshooting: Hot glue provides the answer. By September of 2009, with a robust prototype ready for production, the design team began finalizing part engineering and working with a new manufacturer on tooling. In February 2010, the product was ready for final certifications. Somewhat nerve-wracking was the fact that final certification of the product can only happen after it has been tooled up, leading to the possibility that any significant design changes required to pass certification would also require expensive tooling changes. Augustine notes that a wise strategy is to get to know testing labs well in advance of tooling. "Go early and go often," he says. Final hurdle While subsequent tooling stages through the early part of 2010 revealed fairly typical manufacturing issues, one problem emerged in the pilot run that summed up the unusual nature and sensitivity of the Humanair. The pilot unit, which arrived in April 2010, was not achieving optimum performance due to, it was discovered, a change in the manufacture of the paper filter. Closer inspection revealed that conductivity was being affected by the carbon content of the ink strip on the paper filter, and how the ink was applied to the paper. Augustine reflects that this last hiccup was endemic of the whole project, where many of the challenges were in translating an invention into a product. "It's a great example of what was so hard about this project. There's an inventor but it's our responsibility to bring it to production. We never had a discussion with the inventor about how thick the ink should be." Troubleshooting the ink to control conductivity in a high-voltage environment. Conclusion With few exceptions, corporate marketing strategies rarely involve detailed accounts of a product's development. In the case of the Humanair, however, the dogged pursuit of a singular vision--of a small, silent, energy efficient unit that cleans the air without adding noise or pollution to it--makes a compelling design story. Perhaps the home truth of the product's four-year development is that achieving a simple goal takes a great deal of effort. 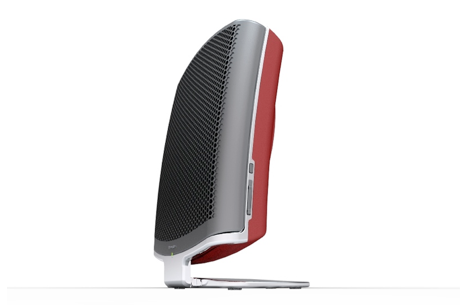 For more information about Humanair, visit www.humanscale.com/humanair. Peter Hall is senior lecturer in design at the University of Texas at Austin, where his research focuses on mapping as a design process. He has written widely about design in its various forms, including gaming, elevators, bridges, neon lights and office chairs, for publications including Metropolis, I.D. Magazine, and The Guardian. His books include Else/Where: Mapping (2006), Tibor Kalman: Perverse Optimist (1998) and Sagmeister: Made You Look (2001). Since 2006 he has been Vice President and co-organizer of DesignInquiry, a non-profit educational organization devoted to researching design topics at intensive, team based gatherings. .3 microns is decent but still doesn't deal with harmful respirable particles that can infiltrate the lungs. Another factor is measuring how well the purifier works over a longer period of time, something the CADR tests don't do so well. It's hard for the smaller air purifiers to be very effective. The localized approach is interesting but it may not provide health effects for those with chronic conditions like asthma. Where are the facts? .......................This reduces VOC chemicals? really? how much charcoal is used? 2-5 years per filter. GET REAL! In my tests its ABOUT A WEEK before its spent ! It's not over yet by a long shot. A product that produces "virtually no ozone" isn't safe. Hot melt glue isn't inert either. More work to do yet lads, particularly since, as is noted, even slight variations in the manufacturing process can have dramatic effects on the efficacy of each and every unit. Isn't it impressive when a clear mission statement leads to a great outcome. Whether we're talking about a privately manufactured product or a government program, a clear mission statement is oh so critical.